So many of my guest blogs are about dealing with the loss of my son Joshua. They focus on pain and grief memories and are—let’s face it—sad. Because it is sad, but, today, I want to focus on the joy that God has allowed me to experience in conjunction with and despite the overwhelming pain. —and nothing to grab hold of to keep me from sinking further. I couldn’t even imagine that I would ever find my way out. Many times, I am not even sure I wanted out; the grief was punishment for the guilt, but I will save the guilt for another blog. Today, my focus is on the joy that I have found with and through the love of Jesus Christ—and the many people that He used to guide me and surround me with that neverending love. It is such a cliché that you find out who your true friends are when you are at your lowest because all of your friends are not necessarily part of God’s plan to help you. Many times, He sends complete strangers or people that you have not known very well. God places them in your path to help you pull yourself up and keep moving and to eventually find your way in life. Oh, not just to find your way but to find your joy again! I cannot begin to name every person whom God has used in my life, and I won’t even try because, invariably, I would leave someone out and thus diminish the impact of actions big and small that gave me the strength, courage, and hope to find joy in life. I have had so many wonderful people reach in and have experienced so many acts of love, kindness, and encouragement that it would take a book to list them all. My goal today is to convey to hurting mothers everywhere that are in the early stages of this devastating loss that God is your handhold and that He will use so many people in large and small ways to help you. Many of the people who helped me did it without realizing what they were doing, and it took me hindsight to realize that it was God’s hand at work. The author of this blog site (Espressos of Faith) is one example of small things that now begin to show up as part of God’s overall plan and in His timing. Bonnie was a person I met while living on Kwajalein, a small island in the South Pacific. I met her as part of a Bible study and later as the treasurer of a ladies’ organization that I volunteered for raising money for school supplies and other basic necessities for the children living on numerous islands. Our interaction at the time did not seem important or dramatic. We were friendly, spoke when we saw each other, attended chapel together, and shared normal interactions and prayer during Bible study. We were not, however, what you would call instant friends. God has allowed our friendship to grow and mature over time and, only in the past year, has He truly revealed how much He used Bonnie to help me heal and find the joy in life again. It is through my writing and blogging that I have been able to express and actually see it visually on paper and that I realize what a beautiful friend she has become and how God has used her to impact my life—then and now. 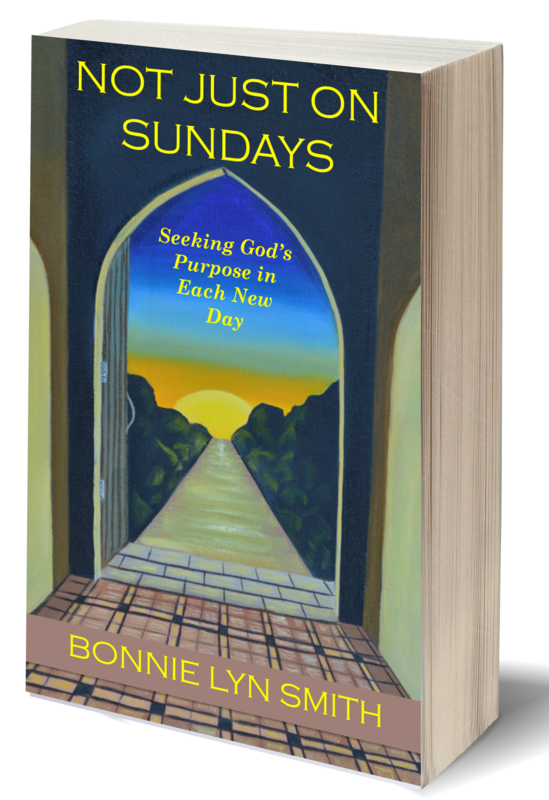 God is using Bonnie in a mighty way, and I am only a small part of her influence, but that small part is very BIG to me. It is such a shining example of how God uses the small things and seemingly insignificant events to work in His plan. And we know that in all things God works for the good of those who love him. Who have been called according to his purpose. But even then I held onto that Bible. I carried it on the plane with me as we flew home and tried to find the comfort that even in my pain and anger I believed was there. Slowly (very slowly), I began to find comfort in God’s words and in the loving kindness of the people who God placed in my path. My prayer for you is that you will find that comfort too. When I told him about my anger, my pastor once told me that “God is a Big God, and He can handle your anger.” No stronger words could be spoken, and if that is all you can find in this blog to grasp onto, then it will be enough. God is real, and He loves you. He understands your pain more than anyone else because He too lost a son. So, take small baby steps, and each day, you will find they are a little bigger. I personally hold on to God’s promise that I will see my child again in heaven. One of the things that provides comfort for me is imagining him worshiping at God’s altar with no more pain and sorrow—but healthy and happy in the arms of Jesus. It has been and continues to be a long journey. The pain will never ever go away, but with God’s love and the help of many others that He will place in your path, you will learn to live with it and will be able to find your joy again. Life today is beautiful. I have another son, Brian, who is so much a part of my joy and six beautiful grandchildren who provide such overwhelming joy that it is almost impossible to contain it all within my heart. God’s promises are real, and if you follow His path, you will find more joy in life than you ever imagined. Please feel free to comment on this blog, and I promise I will respond. Even if it is a negative comment, I will understand. This is a rough journey and one that is so full of ups and downs. Believe me when I say that I have been where you are. I understand the pain. I have tried to drink it away, eat it away, and run from it. I have even done things to sabotoge myself (not physically harm) and my reputation. God loves you, and He wants you to find joy in Him. He is with you, and He has a plan for you. *This post has been shared at Grace & Truth, Mom 2 Mom Monday Link-Up, Make a Difference Mondays, RaRa Linkup, Saturday Soirée Blog Party, A Little R & R, Dance With Jesus, and Christian Mommy Blogger. I’ve also lost a child, but not to suicide. I hope that I never have to go down that road. This post is so brave. Thank you for being this voice that I’m sure so many parents need to hear. Amy, I’m so sorry for your loss and that ache in your mother heart. I was reviewing this blog and thought I had already replied to you. Sorry about that. Thank you for stopping by here and reading Tammie’s blog. I hope you find some measure of comfort knowing the journey is not walked alone. Thank you for sharing here. My brother killed himself five years ago in April. It has been such a hard thing to overcome. I still can’t forgive myself. And I remember how I decided never to be happy after that. It just didn’t feel right that I could be happy and he had to die because he felt so bad. Finding joy still seems such a slap to the face. How can I be joyful? How can I allow myself to be joyful? God is working in me. I know that. And He has all this mercy to me. If He has forgiven me, how can I not forgive myself also. But I still don’t really understand that with my heart. Still on the long journey from darkness to light! Joanna I can feel your pain. Nothing I say sill take it away but I promise you God can help you deal with you pain and guilt. Your Brother would it wa t you to hold on to guilt. You are not responsible for what happened. I am praying for you. Oh, poor dear. I can’t say I know how she feels. I can’t imagine the pain she is experiencing. May the Lord continue to walk with her on this journey. Mary Collins I appreciate your comments and your prayers…. Tammie, beautiful words of encouragement. I just forwarded this to another Kwaj lady who just lost her daughter to suicide. God bless! Connie please pass on to your friend that I am praying for her and her family. If she ever. Wants to talk pm me and I will send my phone number.. Praise God that no matter what we must endure on earth, He offers joy in Him, in knowing He will never forsake us and that He is working all things together for our good, and that we have the sure hope of blissful eternity with Him in Heaven. Linked up with you at Faith Along the Way — hope you’ll stop by Saved by Grace for a visit! Thanks so much for the encouragement t prayers. Praying that God continues to walk you through this, and that His angels and the Holy Spirit are with you in everything you do. Choosing to live with joy in your heart, no matter the circumstance, is the only way to live. I am so sorry for your loss. Kim I am so encouraged by people like you who are praying for me and other Moms. Thanks so much. I am speechless. I honestly have nothing intelligent to say. Tears. Tears and prayers. Thank you, BlestWithBoys. Prayers are more than enough. Thank you for coming by to read Tammie’s post. Janet, I am so sorry to hear this. It’s so wonderful you let God use you to help others after walking through your own pain. You are a few years ahead of Tammie in your loss, and I think she will draw much encouragement reading your comment. I’ll let her know you left some thoughts for her here. I’m so thrilled for your 7 year old boy and for you…to have another chance to mother and love. God bless you for your courage to spread you mother love to another child. So beautiful.